The need for an active Recovery Program for the Corroboree Frog was identified in 1996. The decline of the Corroboree Frog was first documented in research by Dr Will Osborne. His work established the need for an active recovery program which was established in 1996. At that point, the factors causing the decline of this species were unknown, and we were acquiring the skills and knowledge to implement the actions needed to save these species. Since then, much has been learnt and achieved, and we are now in a strong position to pursue the long-term objective of ensuring a self-sustaining and robust populations of both Corroboree Frog species in the wild. 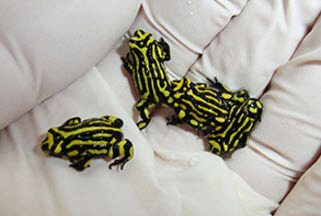 This includes securing the three genetically distinct management units of the Northern Corroboree Frog. The success of the recovery program to date is the result of a multidisciplinary and dedicated team of people working collaboratively, which has included field and laboratory researchers from universities, husbandry experts from zoo institutions, and field officers, rangers, and managers from government agencies. More details about the Corroboree Frog Recovery Program can be obtained from the National Recovery Plan for the Southern and Northern Corroboree Frog.